Three albums, in five years, on three different labels. Why can’t Surfer Blood just settle down? A career that began with the ambitious Astro Coast on Brooklyn’s upstart Kanine Records moved swiftly into the disjointed, yet still flashy Pythons on major label Warner Bros. Now, Surfer Blood has moved on yet again and finds itself back on the indie circuit, this time with 1000 Palms, released on the eclectic Joyful Noise Recordings. 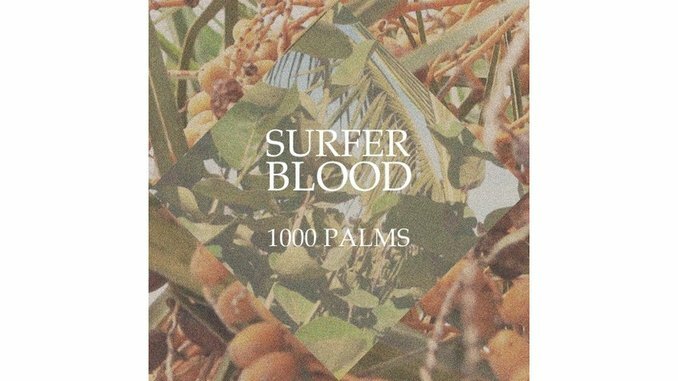 Unfortunately for them, this move hasn’t helped propel their sound into something remarkable and instead, 1000 Palms sees a once-promising band playing it safe at every turn, without a hint of improvisation. The single “I Can’t Explain” is the brightest spot on the album, but the high lasts for the five seconds after the track ends, before “Feast/Famine” sputters into unimpressive boredom, with its basic ‘90s teen ska/punk groove and even simpler drum beat. Complex and lyrically ambitious songs like Pythons’ lead single “Demon Dance” have been replaced by a more generic sound akin to the band’s beach-inspired name. “Into Catacombs” is a poor attempt at ripping off Blue Album-era Weezer, with lines like ”My baby just wants to rest,” getting layered with frivolous harmonies. Songs often feel like a different rendition of a previous one on the album. “Other Desert Cities” starts with a worthy riff, but much like “Into Catacombs,” the lyrics are tame and littered with beach-y cliches. The minimal guitar solo on “NW Passage” stands out, but it would resonate more if it weren’t coming from a band that has accomplished enough in its career to create loftier expectations. After a while, the chorus becomes repetitive with “Now we have found, our NW passage” getting repeated ad nauseam. Gone is the stickiness of Astro Coast’s “Floating Vibes.” Gone is the bravado of “Say Yes To Me,” a now unfounded glimmer of hope from Pythons. Singer John Paul Pitts’ monotone delivery has gotten lazier and less bearable. The inventive harmonies of the past are lacking the bravado and reckless fun that previously stirred up a Surfer Blood track. Every song has the same rubric: Pitts sings a soft verse, then a punchy chorus into a basic guitar solo. Rinse, repeat. Over and over again. There’s no deviating from this formula as 1000 Palms is a disappointingly reclusive step for a band whose once-bright star might have finally stopped flickering.